Soapstone is a natural stone that is used for kitchen countertops and other interior design elements. The unique, rustic beauty of this stone is especially suitable for rustic and country style home décor. Soapstone countertops are also used in some traditional and eclectic kitchen design styles. There are benefits and limitations to using this type of stone for countertops. Soapstone countertops have a natural beauty and warmth. The natural stone industry offers soapstone in colors that range from white to charcoal grey in color. Some of the more common stone colors include grey and solid darker colors, such as charcoal grey and black. 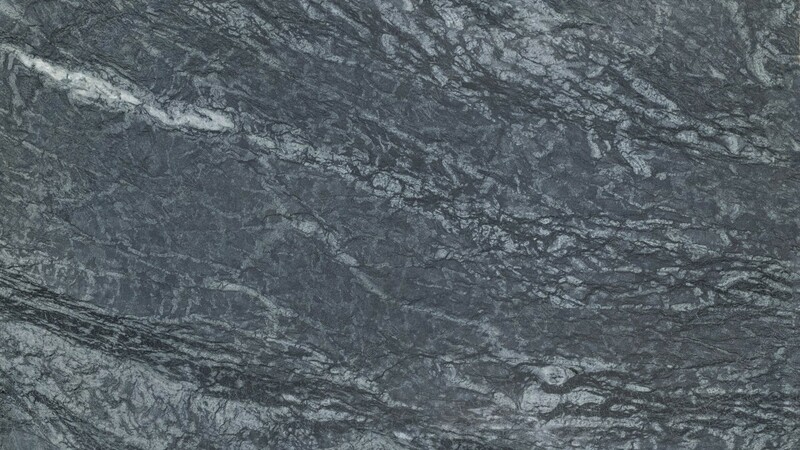 Soapstone is loved for its natural beauty and rich marbling, particularly the white and grey veining of Barroca soapstone. Soapstone is not porous like many other types of natural stone. For this reason, it won’t stain easily, does not need to be sealed, and can be cleaned up with soap and water. When you choose this type of stone for your kitchen countertops, you won’t need to worry about spilling wine or acidic foods on the counter, as with other types of natural stone. 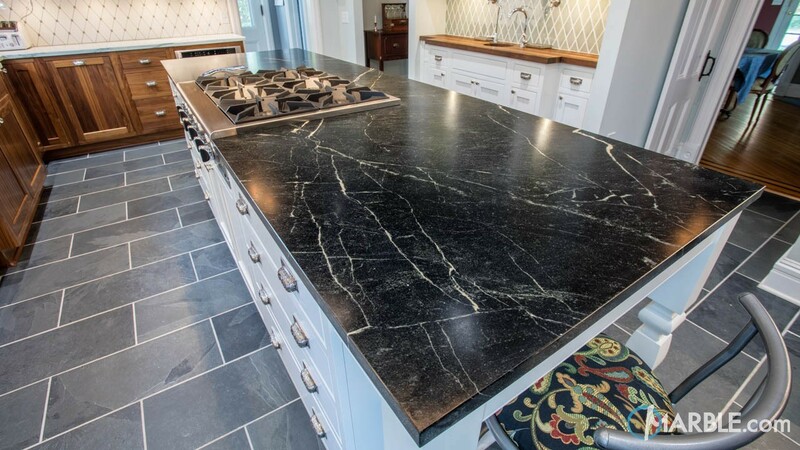 The lack of porosity also makes soapstone a healthier choice because there is less risk of bacteria seeping into the stone and possibly causing sickness. Although sealing is not required to protect soapstone counters, oiling the stone with natural mineral oil can be done for aesthetic purposes. Oiling the stone helps keep it looking great and creates a darker look if you want to speed up the darkeing process. But naturally, over time, the stone inherits an attractive natural, dark patina. Another benefit of soapstone is its natural heat resistance. Hot pans won’t burn the countertop, as can happen with many other types of stone. This means you can place pots directly on the counter without causing damage to the stone. Soapstone contains talc, which gives the stone its unique milky look and feel. However, stone with a high talc content is also softer than other natural stone. The degree of softness varies with the amount of talc in the stone. The softness of this stone makes it less durable when used in kitchen countertops. For this reason, it is better for use in kitchen design for low traffic kitchens, fireplace surrounds, and shower or bath surrounds. Although the stone can handle hot pots and pans, it can still be damaged. Due to the softness of this stone, you should avoid dropping heavy pots and pans or cutting directly on the surface. If you choose this type of countertop for your kitchen, you will need to use a cutting board to prevent damage to the surface of the counter. The lack of diverse stone colors is another drawback for many people. While this type of natural stone comes in a variety of gray colors, there is not nearly the number of color options as you will find in other types of stone, such as granite. If you want more color in the countertop, granite may be more suited to your needs. SlabMarket facilitates the sales and purchase of slabs for professionals in the natural stone industry. If you own a slab yard, join SlabMarket to increase your options for types of natural stone and stone colors. Add a few Barroca soapstone, and other items to build containers and give your customers plenty of options for natural stone slabs with exceptional quality and value. Soapstone will surely bring a rustic, aged, and modern look to any room you install it. It has an old-world feel that that is sure to be an attention grabber. Look at a beautiful kitchen with soapstone installed at Marble.com!